In the week leading up to Super Bowl XLVIII, midtown Manhattan turned into Super Bowl Blvd, a football fanatic’s dream. The event included dozens of fun, engaging activities for traveling fans and New Yorkers alike. 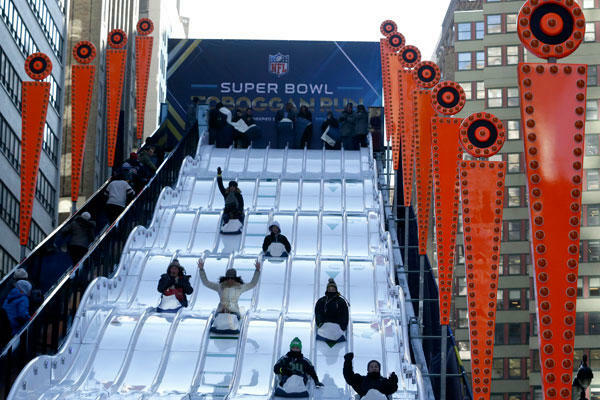 Everything from autographs and photo ops, to broadcast sets from ESPN and FOX—and even a 60 foot toboggan slide—were on display. “At first I was very interested in finding out how the NFL was incorporating such progressive technology as beacons into Superbowl Blvd. The first step of the process was to download the NFL app, which wasn’t a bad experience until I had to enter almost all of my personal info to be able to access the app content, and on top of that I had to authorize them to send me messages; which was the first poor consumer experience. The first message arrived within a minute of being there. The message welcomed me to the Superbowl Blvd and reminded me to visit the vendors and participate in the activities. I walked with my phone up and down the SuperBowl Boulevard waiting for the next message to arrive. I tried looking for the Beacons in case I wasn’t close enough to one, and I even tried holding my phone up looking for any type of signal; the second bad experience with beacons. As a shopper you need to keep your phone on your hand at all times, if you don’t know where the beacons are placed. Brands need to find a way to control how these messages are delivered to the consumers, having an aisle full of these can make the shopping experience very overwhelming for the consumer. It is fundamental to let the consumer know where the beacons are placed, so it makes them look forward for the message, instead of surprising them. While beacons do have some exciting potential, they seem to lack the proper execution needed to deliver a solid user experience. It’s important to remember that other mobile triggers such as QR Codes have a higher adoption rates and at this point, are much easier to execute. Stay tuned for part II next week, as we’ll discuss specific examples of NFC and missed mobile engagement at Super Bowl Blvd.